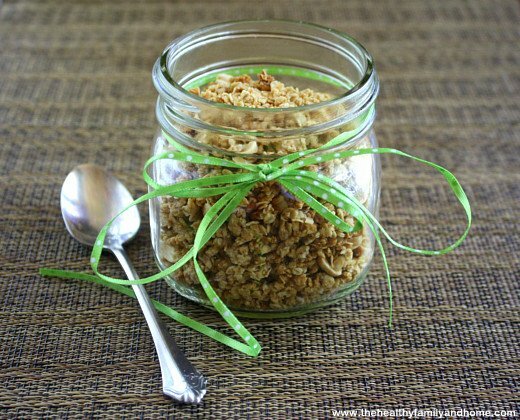 This Vegan Homemade Peanut Butter Granola is a favorite for breakfast time in my house…my boys love it! In fact, when I make it, they politely ask me “please don’t cook it” as they each get a spoon and proceeded to eat it right out of the mixing bowl. And I don’t blame them…it really is that good! The reason they requested the peanut butter granola is they have eaten the Nature’s Path Organic Peanut Butter Granola in the past but it’s rather pricey at $4.79 for a small 11.5 ounce box. 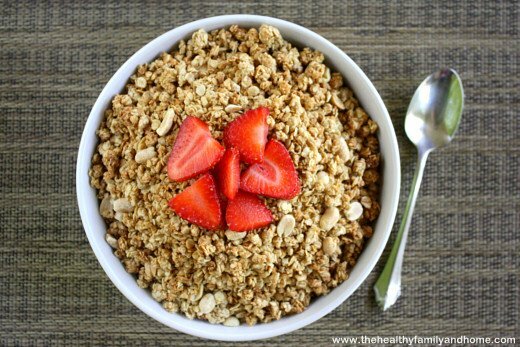 Ingredients: WHOLE GRAIN ROLLED OATS, WHOLE GRAIN WHEAT, SUGAR, RICE, CORN SYRUP, ALMONDS, CONTAINS 2% OR LESS OF MOLASSES, MODIFIED CORN STARCH, PALM OIL, SALT, CINNAMON, NONFAT MILK, MALT FLAVORING, POLYGLYCEROL ESTERS OF FATTY ACIDS, NATURAL AND ARTIFICIAL FLAVOR, GUAR GUM, BHT FOR FRESHNESS. Nonfat Milk – unless it is organic or comes from a small family farm, you don’t know what the cow has been fed (GMO-grains) or if it has been given antibiotics, hormones, etc. Since that is definitely not an option and I didn’t want to pay for the small organic box, I looked for an easy recipe with wholesome ingredients and was happy with the one I found. 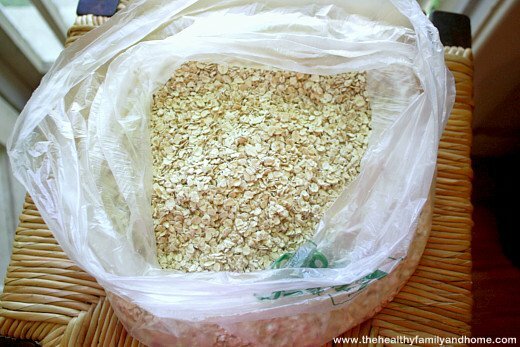 It’s really easy to make, has a short ingredient list and is vegan and gluten-free too if you use gluten-free oats. 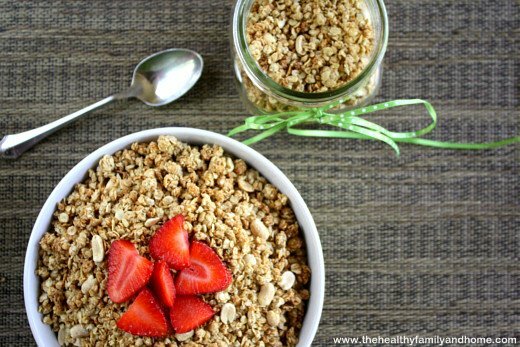 Serve it with homemade coconut milk or homemade almond milk and you have a 100% homemade breakfast your family will love! 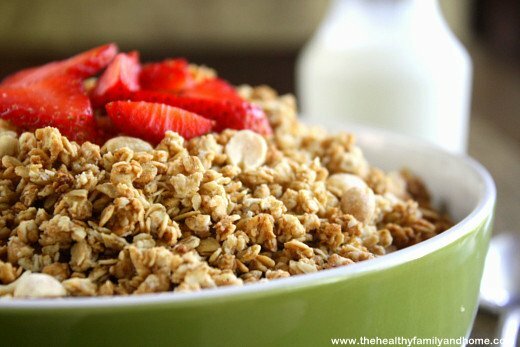 Tip #1: If you are going to make a big batch of granola, it’s best to buy it in bulk. I buy mine from the bulk bins at Whole Foods, but if you don’t have one close by you, you can get some in bulk from the Amazon link above. 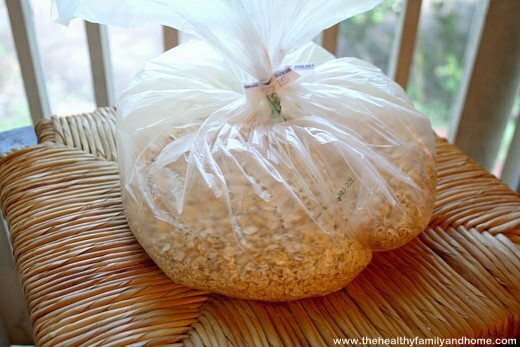 Tip #2: You could add other ingredients if you’d like, like shredded coconut flakes, pumpkin seeds or even flax seeds. 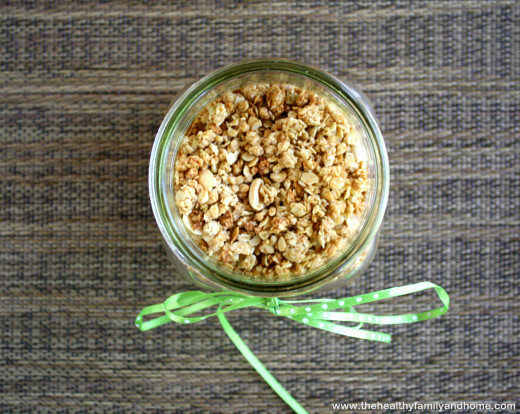 Tip #3: To keep the granola fresh, I store mine in glass mason jars with the BPA-free lids. 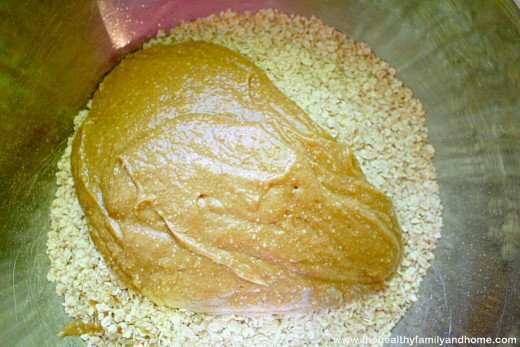 Step 1 In a medium sized bowl mix: peanut butter, maple syrup, vanilla extract and coconut oil (melted/liquid) and stir until well combined. 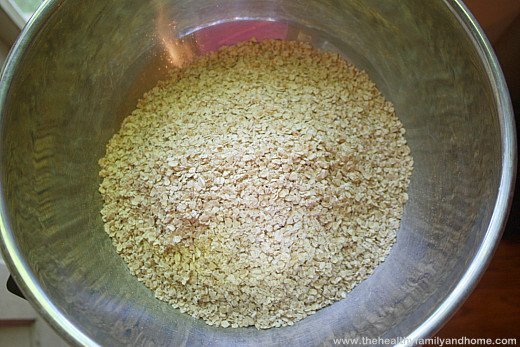 Put the oats into a large size bowl and stir the peanut butter mixture into it. Combine together (with your hands works best) leaving some big chunks, if desired. Spread onto cookie sheet or baking pan (you may have to do two batches). Bake at 350 degrees for 10 - 15 minutes keeping a close eye on it. You want it to be crunchy but not overcooked and burned. Toss in the peanuts, if desired. 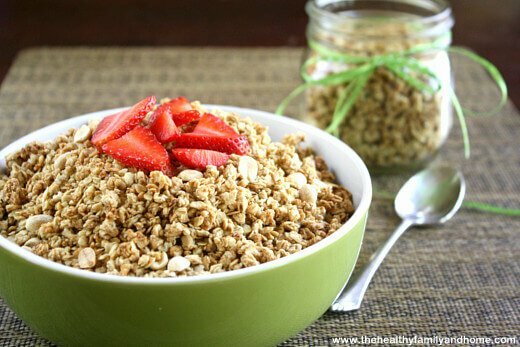 I am out of maple syrup and really want to make this, can I use agave nectar instead? Do you think it’ll taste okay? Hi there Kelsey! I haven’t tried that before, but you should be able to use agave nectar, raw honey or even raw coconut nectar in place of the maple syrup without a problem. The liquid sweetener is kind of what holds it all together. Since the taste is very similar to maple syrup, I don’t think it would alter the flavor in regards to the sweetness. Silly question possibly but do you store it in the refrigerator or cupboard? Going to make some today! Thanks for the recipe as always. I keep mine in the kitchen cabinet either in a large glass mason jar (quart size) or a BPA-free plastic container (like this one: https://amzn.to/1nQ0HHS), depending on how much is left over after I make it. More often than not, between my husband and two boys, they usually wipe out an entire batch at one time and there really isn’t any leftover lol! This sounds awesome. Would it be possible to substitute honey for the maple syrup? Hi Jessica! Yes, you sure can! 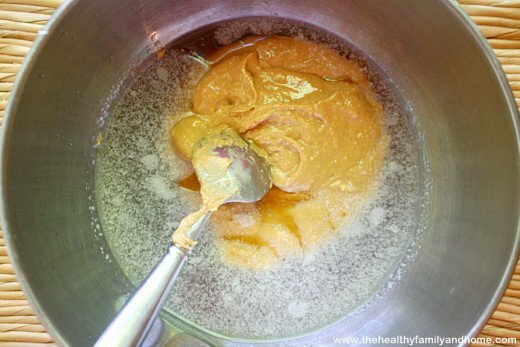 I usually use raw honey in my raw recipes and maple syrup in “cooked” recipes, such as this one, but you can certainly use honey in place of maple syrup. Hi Nichole! Thanks so much! 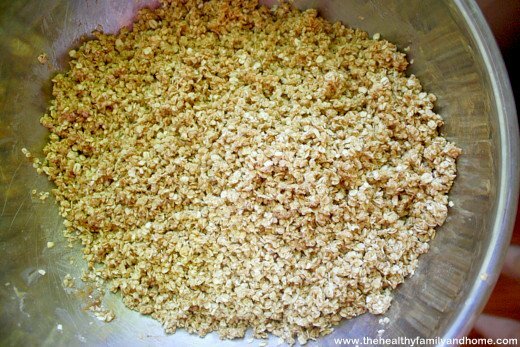 It is a favorite in our house too and if my husband would have his way, I would be making a batch of it everyday lol! I do try to make it at least once a week because both he and my boys love it so much. I have to tell you that my kids and I can’t get enough of this stuff! They eat it for breakfast for cereal every day and then ask for more. It’s VERY filling and healthy! Thanks so much for the recipe! Hi Jennifer! I’m so glad to hear that! My boys love it too and even my husband (who is hard to please sometimes) gives it a thumbs up! I like it because it’s really easy to make and clean ingredients too! I made this recipe. It was super easy. It turned out great and my husband (usually a cheerios guy) loved it. I am sharing it with my family as well. Thanks so much. I have also shared your awesome website! Great job on everything!